In the Tibetan Buddhist tradition, the various stages of living and dying are viewed as powerful opportunities to awaken. These intervals, which are referred to as “intermediate states,” or “bardos,” encompass six forms of experience: the state of meditation, the dream state, the state of deep sleep, the death process, the interval between death and rebirth, and the process of rebirth. Each of these intervals presents a unique chance to discover the heart of enlightenment in the midst of the present moment. Learning about dying teaches us how to live, and learning about living teaches us how to die. Most importantly when we view the continuity of these processes—their circularity and re-occurrence– the distinction between the concepts of life and death begins to dissolve and this changes the perception of everything. 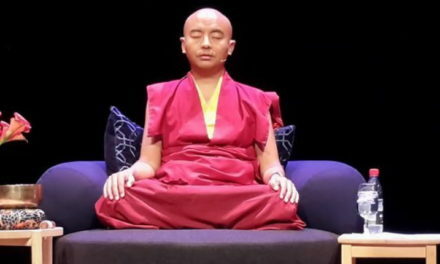 Mingyur Rinpoche will also introduce Phowa, the practice for ejecting consciousness at the time of death. To learn this critical practice now reduces our fear of dying, and liberates consciousness from Samsara to Nirvana. This in turn transforms our daily living. Rinpoche will give the teachings and transmissions for students to begin the Phowa practice. There are no prerequisites to attend this program. 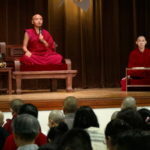 Due to the focus on traditional Tibetan Buddhist teachings, however, the program may be better suited for those with some experience of meditation. 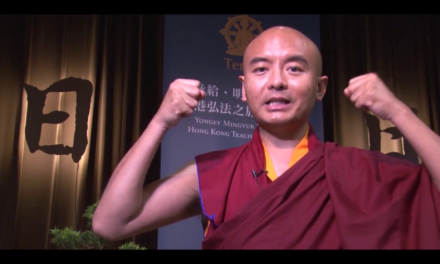 Yongey Mingyur Rinpoche is a much-loved and accomplished Tibetan Buddhist meditation teacher. 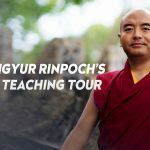 With a rare ability to present the ancient wisdom of Tibet in a fresh, engaging manner, Rinpoche’s profound teachings and playful sense of humor have endeared him to students around the world. His first book, The Joy of Living: Unlocking the Secret and Science of Happiness, debuted on the New York Times bestseller list and has been translated into over twenty languages. 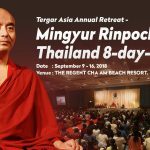 In early June, 2011, Mingyur Rinpoche walked out of his monastery in Bodhgaya, India and began a ‘wandering retreat’ through the Himalayas and the plains of India that lasted four and a half years. 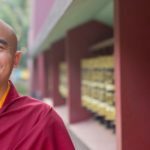 When not attending to the monasteries under his care in India and Nepal, Rinpoche spends time each year traveling and teaching worldwide. HK$780 for the four days. The teachings and lunches are free for people living in Nepal, India and Tibet and for ordained Sangha. Donations would be most welcome, and online registration is requested. For those who aren’t staying at Osel Ling, a vegetarian lunch will be provided at HK$200 for the four days. You may of course bring your own picnic should you wish. We recommend that you sign up and pay for lunch when registering so that we know how many lunches to order, or bring your own lunch, as there are no restaurants at a convenient distance around Osel Ling Monastery. Limited accommodation is available at Osel Ling for those attending from outside of Nepal only, and will be allocated on a “first come, first served” basis. The cost for four nights beginning 23 November includes three meals a day is HK$585 in total. Accommodations consist of a basic single bed in a dormitory-type situation with no attached bathroom in the monastery – no single rooms available. Blankets, sheets, pillows, and towels will be provided, but as it’s cold at night in November, those selecting this option might want to bring sleeping bags. Please be reminded that Osel Ling might not be able to provide enough warm water for guest. Those needing to stay an extra night or two before and after the teachings could do that at an extra cost. Please email nepalteachings@tergar.org to request additional accommodation. Full payment is due at enrollment and can be paid by credit card, UnionPay and AliPay. Registration for the course will be started on 6pm August 8, 2017 HK time. What teaching programs are happening and what are the dates? 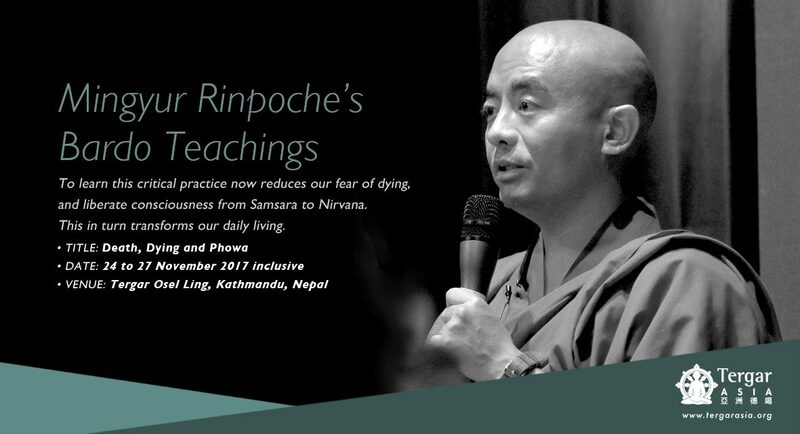 Mingyur Rinpoche will teach “Death Dying and Phowa” on 24 to 27 November at Tergar Osel Ling, Kathmandu, Nepal. 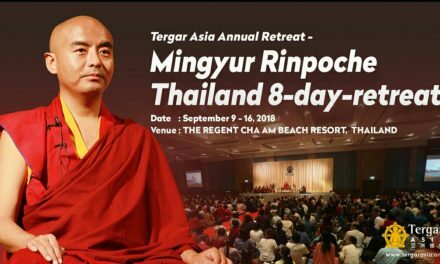 There are no prerequisites for the programme, but as the teachings are traditional Tibetan Buddhist ones they are more suitable for those with some experience of meditation. How can I register for the teaching program? What is the daily teaching schedule? The program is scheduled to begin at 9am and end at 4.15pm every day. The schedule is subject to change and a more detailed one will be sent out nearer to time. 23 November 10 to 4pm Arrival at Tergar Osel Ling, registration and accommodation. You can register and get your wristband and be shown to your room if you have booked accommodation from 8am on 23 November. Registration will be open again from 8am to 10am on the morning of the 24 November. Please try to arrive by 10am on 24th at the latest as Rinpoche will begin his teachings at 10.30am. Those not staying at Osel Ling can buy lunch at HK$200 for the four days. The teachings and lunches are free for people living in Nepal, India and Tibet and for ordained Sangha. Donations would be most welcome. Please register online though as numbers are limited. Accommodation: We can offer limited accommodation at Osel Ling and beds will be allocated on a “first come first served” basis. The rooms are very basic and without attached bathroom at a cost of HK$565 per bed for four nights. This cost includes three meals a day for four days. An additional night before and after the teachings can be arranged. A simple vegetarian meal will be available but these must be booked before the teachings begin so that the kitchen staff can prepare. Please indicate in the online registration if you are planning to have lunch. You are welcome to bring your own packed lunch. There is plenty of space around the monastery to have a picnic. There are no restaurants or cafés near Tergar Osel Ling. It’s unlikely you will have time to leave at lunch and return in time for the afternoon teachings. What water is available at Osel Ling? We will have some drinkable water for you to refill your bottles. Also, there will be bottled water and other beverages for sale on site. It’s always a good idea to bring your own water. Tea will be available at the breaks. Please bring your cups for the tea as we will not provide paper or plastic ones for environmental reasons. If you don’t have a cup you can purchase one very cheaply from the many shopkeepers below Osel Ling in Swayambhu, thus helping the local economy. Where will the teachings take place? 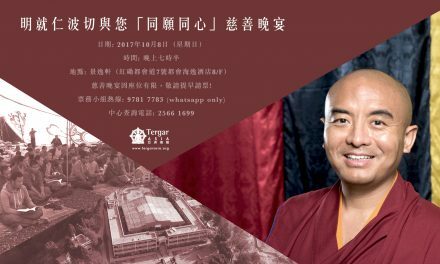 The teachings will take place at Tergar Osel Ling, Mingyur Rinpoche’s monastery in Swayambhu, Kathmandu. Tergar Osel Ling is situated on a hill overlooking the Swayambhu Stupa. The teachings will be given in a large tent in the courtyard. Please wear layers as the temperature can vary! 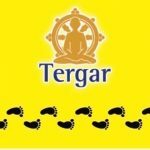 How can I get to Tergar Osel Ling? Tergar Osel Ling is situated at top of a hill overlooking the Swayambhu Stupa. Though the monastery is accessible by road, as it is a steep, narrow road with dangerously sharp corners unsuitable for buses or large vehicles, we are requesting all (physically capable) participants to walk from the walking point indicated on a map. There is one walking route to Osel Ling, which involves climbing a number of steep steps. The footpaths are well signposted. Guides to show you the way will be available at the meeting point only on the first day of the teachings. The guides will meet you at half hourly intervals from 7am to 8.30. Allow yourself 30 to 40 minutes to walk comfortably and slowly. Please wear good walking shoes. The path will be marked with signs and ribbons. For those who cannot walk easily, many taxis are available at the beginning of Karkhana Chowk on the ring road. The cost is generally 300 npr and most taxis will take up to 4 people for that cost. Should you wish to book a taxi to and from Osel Ling please see list of telephone numbers at the end of this sheet and more comprehensive directions to Osel Ling from the airport, Boudha and Thamel. 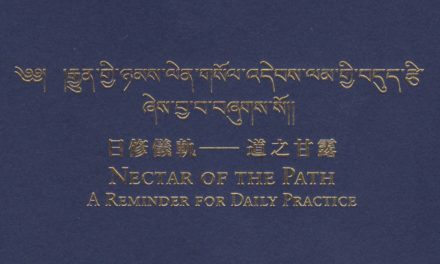 What should I bring to the teachings? Do bring your own cup to use during tea service, a small cushion to sit on although some cushions will be provided, drinking water, paper and pen (if you wish to take notes), a flashlight, as well as toilet tissue and whatever other personal supplies you may need for a day out. Bring a shoe bag if you wish to take shoes with you inside the teaching tent. Please note there are no shops or restaurants near Tergar Osel Ling. The weather may be fairly warm (though cool if not sunny). Please wear layers. It does get cold at night in November so if you are staying at Osel Ling it may be wise to bring a sleeping bag. Please also bring your own towel as we cannot guarantee that we can provide everyone with a towel. 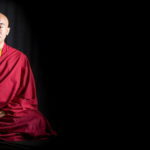 In what language will Rinpoche teach? What translation will be available and what equipment will I need to bring to listen to the translation? Translation will be provided into Nepalese, French, Mandarin and German. We may be able to provide translation into other languages as well. 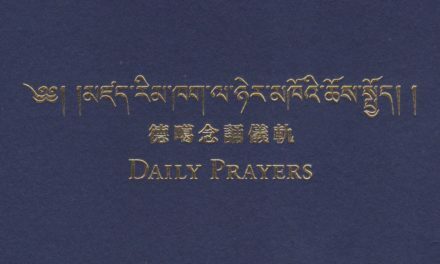 If you have a need for translation, please let us know by emailing nepalteachings@tergar.org. If you are in need of translation, please bring a digital FM radio (battery and headsets too) as these have better reception than analog FM radios. What are the visa requirements for Nepal? Those living outside Nepal who wish to attend the teachings will need a tourist visa during the time of the teachings. Tourists are allowed to stay up to 150 days in a single western calendar year. Tourist visas are available from Nepali embassies and consulates around the world. Tourist visas are also available upon arrival at the immigration counter at Tribhuvan International Airport in Kathmandu. There are interactive computerized visa application machines at the airport which take your picture and print an application form. You must pay in foreign currency. GB Sterling, Euros, or US dollars are all acceptable. It’s convenient if you have as close as possible the correct change. Coins will not be accepted, and change will be given in Nepali rupees. Tourist Visas are also available upon arrival at the land border with India. You will need a passport-sized photo and foreign currency to cover the visa fee. You will be provided with an application form. Where can I stay and how can I book accommodation? Very limited accommodation is available at Osel Ling. We will provide bedding and some towels but you may wish to bring a sleeping bag as it gets quite cold at night and a towel for your own personal use.. Accommodation at Osel Ling must be booked online at tergar.org. It is possible to book accommodation in Kathmandu online through booking.com and trip advisor. For further details please see our Accommodation List (at end of this document). What is the local etiquette? The form of greeting in Nepal is “Namaste” performed by joining both palms together. It literally means, “The divine in me salutes the divine in you”. Do dress conservatively when visiting temples, monasteries or sacred places – no shorts, short skirts, or low cut tops. You will need to remove your shoes. If invited inside someone’s home it is polite to remove your shoes. Food safety – Avoid water that is not bottled or boiled. Avoid raw vegetables and pre-cut fruit as much as possible. Foot wear – Roads and pavements (sidewalks) are uneven with plenty of potholes so sensible shoes are advisable at all times. Pollution protection – Kathmandu is highly polluted. You may want to bring and use a smog mask if you are in any way sensitive to dust and pollution. Simple cotton face masks are widely available throughout the city. You can also purchase disposal masks from all pharmacies. Please note the air quality up at Tergar Osel ling is generally good. The main problem is while traveling across the city. Safety at night – Women travelers are advised not to go out alone at night. Also it is neither safe nor advisable to walk up or down from Tergar Osel Ling in the dark alone. What medical preparation should I make for my trip? Always consult your medical practitioner well before embarking on foreign travel, to discuss your personal medical needs, as well as required vaccinations. What should I bring to Nepal? Clothing & footwear – Short skirts, shorts, or low cut tops are not suitable in a monastery setting. As participants are asked to walk up and down from Osel Ling, sensible shoes are a must. Given the Nepali and Tibetan custom of removing your shoes before you enter a room, shoes that come on and off easily are advisable. In November it can be quite cold and generally buildings are not heated. Day time temperatures can still be relatively high. It is advisable to dress warmly in layers. General items – Any medication, vitamins or supplements you take, special toiletries or cosmetics. You can buy most toiletries in Nepal but if you need brand specific items it’s best to bring your own. You may need a torch (flashlight), sun hat and sunscreen. What kind of telecommunication services IS available in Nepal? While at Tergar Osel Ling – Please note there is no wifi at Tergar Osel Ling, and phone coverage for all mobile companies is generally non existent. Wifi is used widely throughout Kathmandu. Most guest houses, hotels, restaurants, and cafés offer free wifi to their customers. The following map shows the location of Tergar Osel Ling, the listed Guest houses and hotels, Ciwec Clinic, Norvic Hospital, Boudha Stupa and Tribhuvan Airport. We recommend that foreign participants book accommodation ether in the Swayambhu area or in the main tourist area of Thamel and the adjacent area of Lazimpath. We have compiled a short list of guest houses in the area but it is possible to book others through the various search engines, including booking.com, trip advisor, expedia, hostelworld.com etc. Please note telephone numbers are listed for calling from outside Nepal i.e. with the country code 977. When in Nepal the area code for Kathmandu is 01 (rather than 1). Nepali mobile numbers are all 9 digits long and do not require an area code. There are many other guesthouses and hotels in the Thamel, Lazimpat, and Boudhanath areas to meet all budgets and needs. You can easily browse through them online. Information on prices etc is relevant in August 2017. Osel Ling is situation on the top of a hill overlooking Swayambhu Stupa on the other side of the ring road from Swayambhu Stupa and Buddha Park. The general area is locally known as Sitapaila. The monastery can be accessed by car and taxi but not by bus. There are also walking routes which will take around 20 to 30 minutes. Osel Ling is approximately a one hour journey from the Tribhuvan airport in Kathmandu. Taxi fares are approximately 1200 nepalese rupees one way. Ask for Swayambhu Buddha Park and direct the driver to Karkhana Chowk just off the ring road. Osel Ling is well signposted but some drivers do not like to go up there, particularly in a full car because the road is very steep and uneven in places. Telephone numbers of taxi drivers who know how to get to Osel Ling are listed along with a map of directions from the ring road. Taxis: A number of taxis wait at the ring road end of Karkhana Chowk. Most know Osel Ling and are generally happy to take no more than two people in older cars but the newer models can take more. The drivers will advise. The cost is 300 npr per taxi. While the road to Tergar is well sign posted, drivers sometimes take the turning to Lekshe Ling. Make sure you are clear that you want to go all the way to the top!!! Walking: There are two routes. You can walk from the Nunnery directly opposite Buddha Park (shorter and steeper but well signposted) and there are many steps to climb. Buses These are generally mini buses and can get quite crowded. Fares are no more than 30 Nepalese rupees one way. Wait at the opposite side of the road from Boudha Gate and ask for Swayambhu. 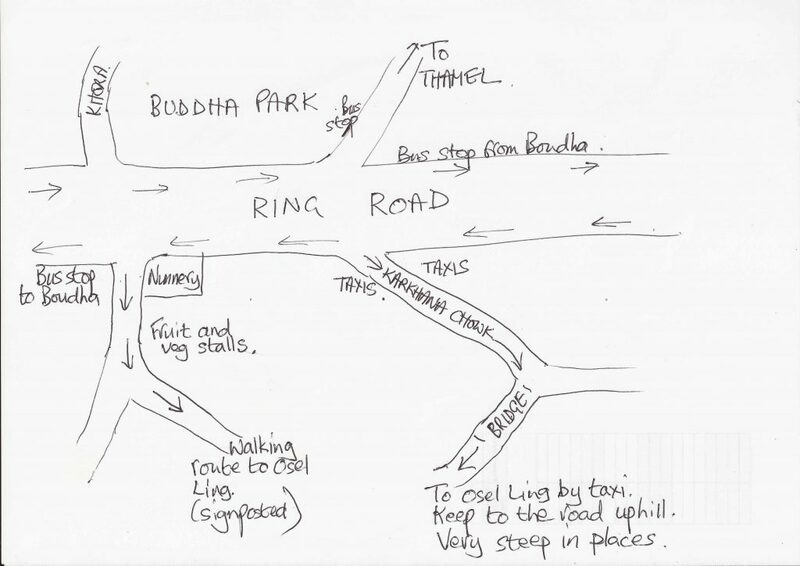 You will be dropped off at Buddha Park on the ring road. 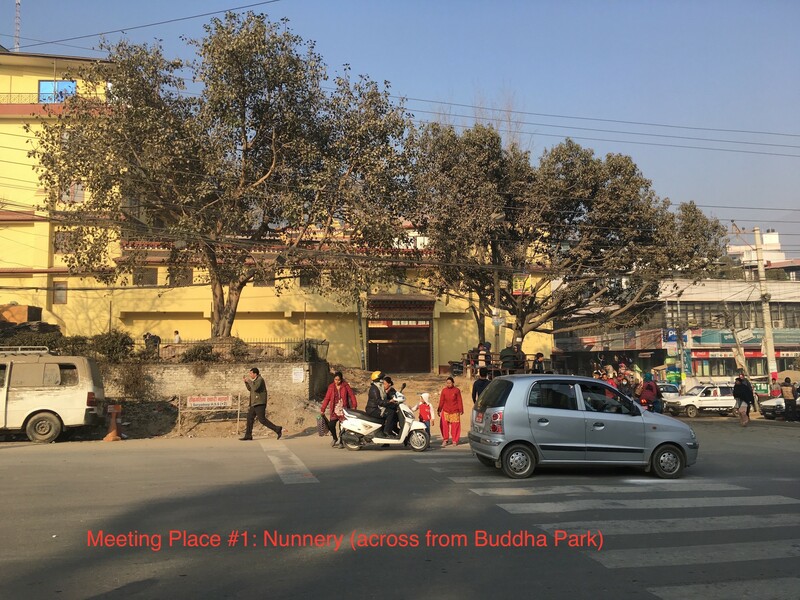 Karkhana Chowk and the nunnery are just opposite, Karkhana Chowk is the road to the left and the Nunnery directly opposite. From here, you can either walk or take a taxi to Osel Ling.. Buses will take you back to Boudha from the ring road at the Nunnery opposite Buddha Park. Taxis: Many taxis are available around Boudha Gate and drivers need clear directions to get to Osel Ling from Swayambhu and Karkhana Chowk. Fares vary, from 800 npr but over 1000 is excessive. Buses These are generally crowded minibuses. Fares are no more than 20 nepalese rupees one way.You can pick up a minibus to Swayambhu at a number of points on the main road in and out of Thamel. For the return journey, buses generally wait just off the ring road to the right of Buddha Park (facing it). Taxis There are many taxis in Thamel but again drivers need clear directions to get to Osel Ling from Swayambhu. Fares vary from 600 nprs to 800 nprs.